It's funny how I don't make it out to West Van as often as I used to. When I was a wee one, our family would make the trek out to Salmon House on the Hill for brunch. Then, back in my University days, I would venture into the British Properties weekly. No, I wasn't up to any illegal activities; rather it was to visit Rich Guy. Now you see where he gets his nickname... More recently, when we used to live in Downtown, it was a mere jaunt over the Lion's Gate. But now, it seems I rarely make it out to the land of Range Rovers and BMW's. Well, today, I had an errand to run in West Van and I was hungry. Guess where this is leading to? Hey, I had to eat! And it was lunchtime! Where? Walking down Marine Drive, I considered Savary Island Pie Co; but it was crazy busy. I'm not one for lineups. 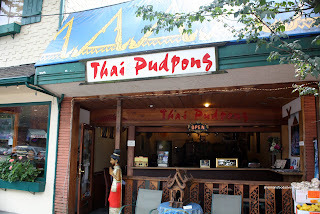 Thus, I kept walking until I arrived at Thai Pudpong. Yes, I know, West Van is not exactly the hotbed of Thai food. 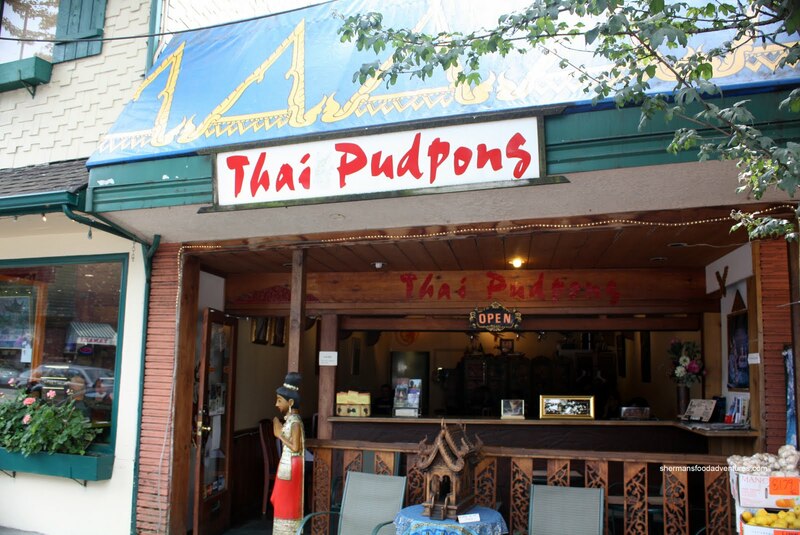 In fact, unlike many other types of ethnic cuisines, there is no designated area that boasts great Thai food. So I thought: why not? Once seated, I was handed their lunch specials menu and it had the typical items for $7.95 each including salad. Being the hungry person that I was, I went for 2 dishes starting with the Shrimp Pad Thai. I found the texture of the noodles to be perfectly chewy while being coated with just the right amount of sauce. However, the sauce itself was bland. Most of the tartness came from the lime. Otherwise, it was only slightly sweet. By the way, the shrimp that you see is the shrimp that I got. It was a good decision to order 2 dishes because they were very modest in size. For my second meal, I chose the Chicken Green Curry. Despite its humble appearance, there was a good amount of tender white meat mixed in with string beans, green and red peppers and eggplant. I liked how the veggies were all still vibrant in colour and texture. For the curry itself, I asked for medium and it turned out to be very flavourful. Definitely spicy, with good amount of Thai basil and smooth coconut milk, this was a good curry. Too bad there was so little rice to enjoy it with. I would say the food here is quite decent, if not small in portion size. Mind you, it was still reasonably-priced considering the location. 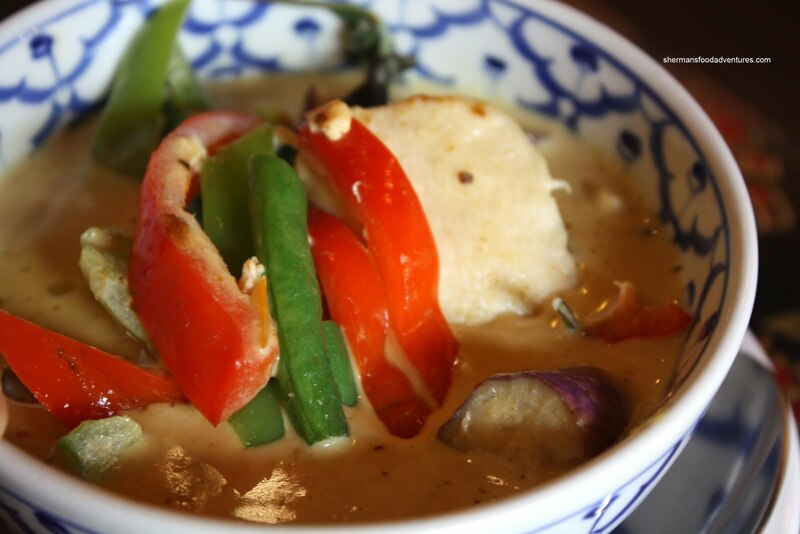 Worth checking out if you have Thai food cravings in West Van. LOL... Could be. 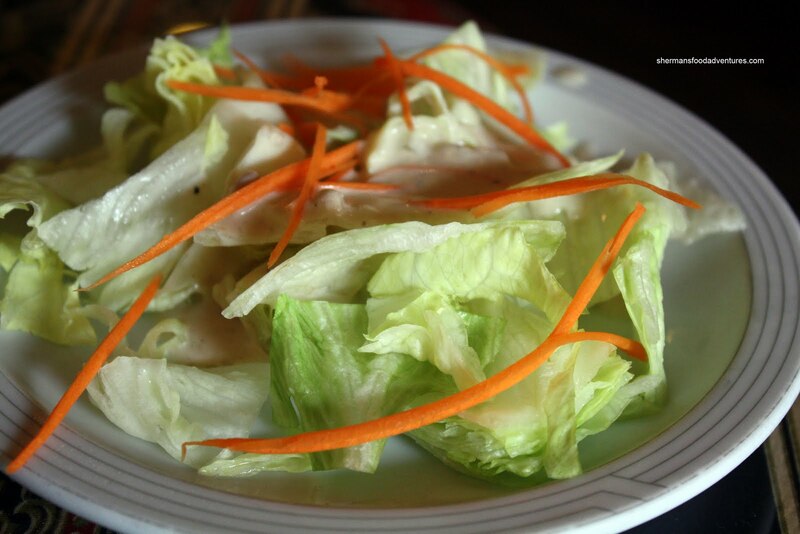 However, the portion size was still quite small compared to other Thai restaurants I've been to recently. At the very least, the price wasn't too bad. 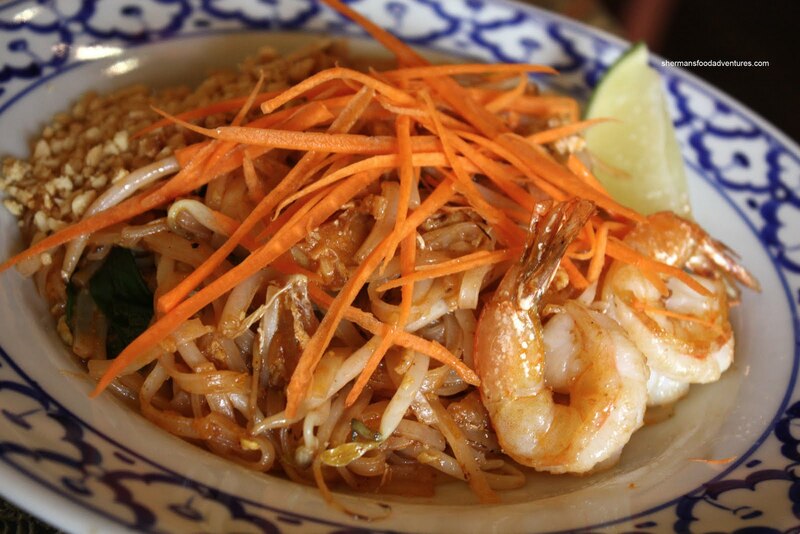 In the case of the Pad Thai, for roughly the same price Sabai Thai and Chada Thai have a larger portion than Thai Pudpong.